Dining with Dignity offers specialty adaptive silverware for people with grip impairments. 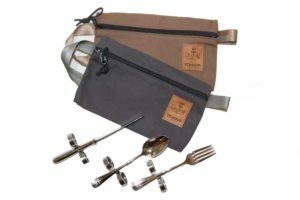 This elegant, patented design enables those with grip impairment to grasp their fork, spoon or knife using a yoke attached to the handle. Designed to be versatile, the stainless steel yoke can be adjusted to fit various hand sizes and gripping angles. Flat Rate Standard Shipping (Contiguous US Only) $9.99 for all orders. Orders over $199.00 ship for free. Never be without your DWD silverware. Get one set for home and another to carry with you at all times. You never know when the Munchies might hit! You can use our products with absolute confidence when you’re out on the town. Each utensil may be twisted to meet your specific grip and strength. 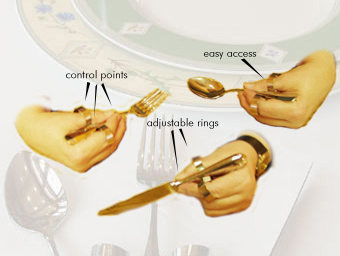 A person with no grip has the ability to “hold” these utensils while eating with no assistance. Our patented design enables those with grasp impairments to grasp their fork, knife and spoon, independently. An elegant adjustable yoke is attached to each handle. Our products are made in the USA, and we use Oneida silverware for all of our products. Thanks!